Friends, colleagues, and family members eulogized former president George H.W. Bush on Wednesday at the National Cathedral in Washington, D.C.
Former president George W. Bush, former senator Alan Simpson, former Canadian prime minister Brian Mulroney, and presidential historian Jon Meacham spoke at the services, describing the 41st United States president as kind, loyal, and energetic. Here’s a look at some of the most powerful quotes and anecdotes from Bush’s funeral services. 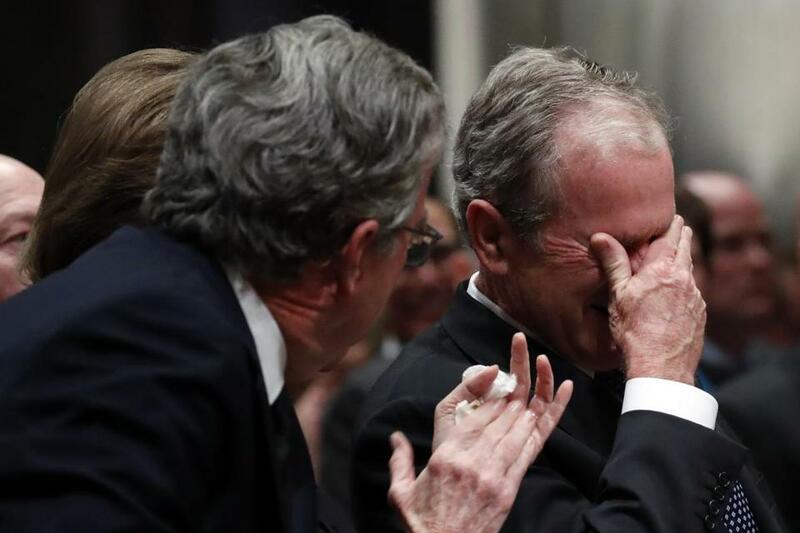 Former president George W. Bush wiped tears from his eyes after delivering a eulogy for his father. In a moving moment, George W. Bush fought back tears at the conclusion of his eulogy as he recalled his father as loving, giving, and a mentor. 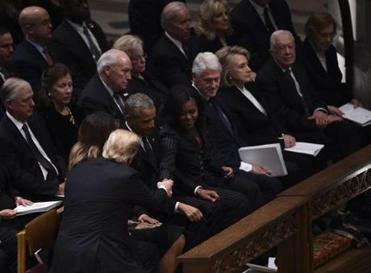 President Trump only shook hands with Barack and Michelle Obama before taking the aisle seat and did not greet any of the other former presidents. Bush could be seen wiping away tears as he took his seat in the front pew. In his last sentence, the 43rd president was referring to Robin Bush, his sister who died at 3 years old of leukemia. In a particularly emotional part of his eulogy, Bush recalled the last conversation he had with his father. Bush also described his dad as someone who served in the Oval Office with dignity and integrity, and said that even in defeat, his father was able to teach his children lessons. “He accepted failure is part of living a full life but taught us never to be defined by failure. He showed us how setbacks can strengthen,” he said. Bush said after thinking about it, he decided that his father probably sped through the leisure activity because he was anxious to move on to the next part of his day. “He was born with just two settings: Full throttle, then sleep,” Bush said, as those in attendance laughed. Bush also recalled his father’s penchant for speeding in his boat in Maine, parachuting at age 90, and reveling in a friend recently sneaking certain prohibited items into a hospital room. He also listed some of his father’s more public faults: “The man couldn’t stomach vegetables. Especially broccoli,” he quipped. 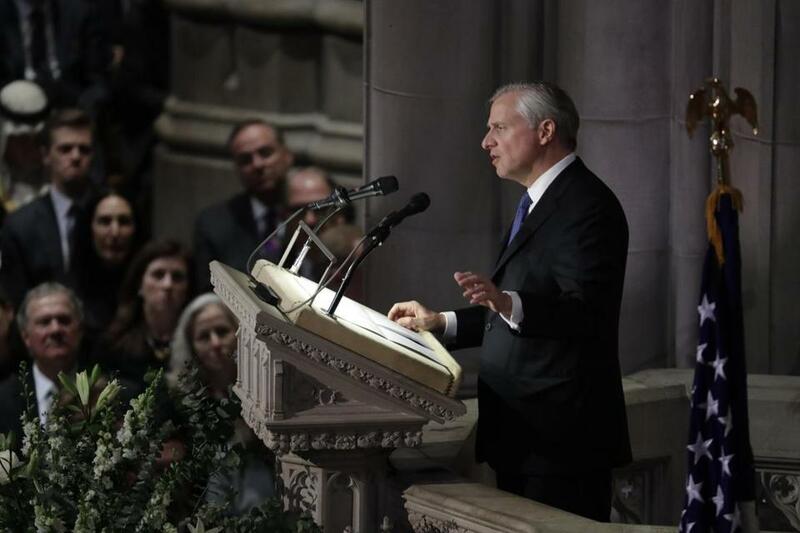 Presidential biographer Jon Meacham spoke during the funeral for George H.W. Bush. Presidential historian Jon Meacham recalled some of the more lighthearted quotes and stories of Bush, including the time that Bush — while asking for votes on the campaign trail in New Hampshire — shook the hand of a mannequin. When Bush realized his mistake, he quipped, “Never know, gotta ask,” Meacham said. 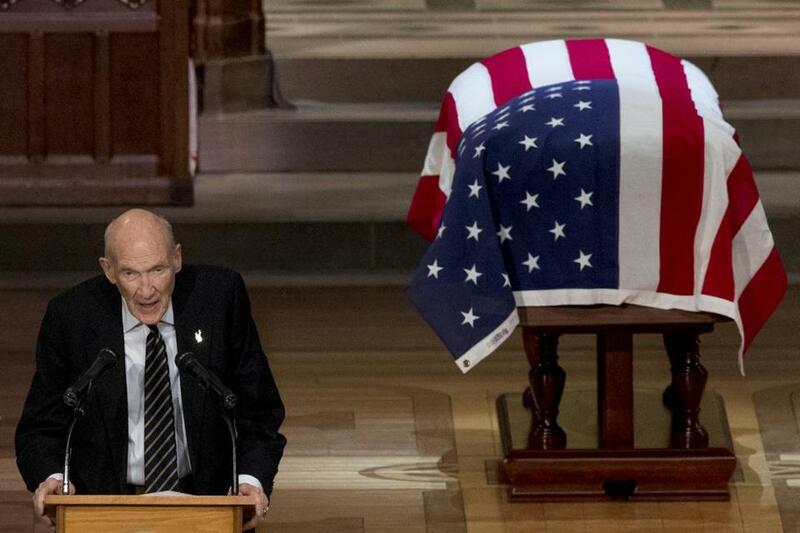 Former senator Alan Simpson, a Wyoming Republican, spoke about George H.W. Bush. Former senator Alan Simpson had a particularly poignant quote — and one that was resonating nationwide amid the fraught politics and partisanship of late — as he spoke about Bush’s decision to sign a bipartisan budget deal in 1990 that included tax increases, which essentially helped seal his fate as a one-term president. “And he was a man of such great humility. Those who take the high road of humility in Washington, D.C., are not bothered by heavy traffic,” Simpson said, garnering laughter and applause from the audience — including the presidents’ club in the front pew. Simpson also said his friend never lost his sense of humor.